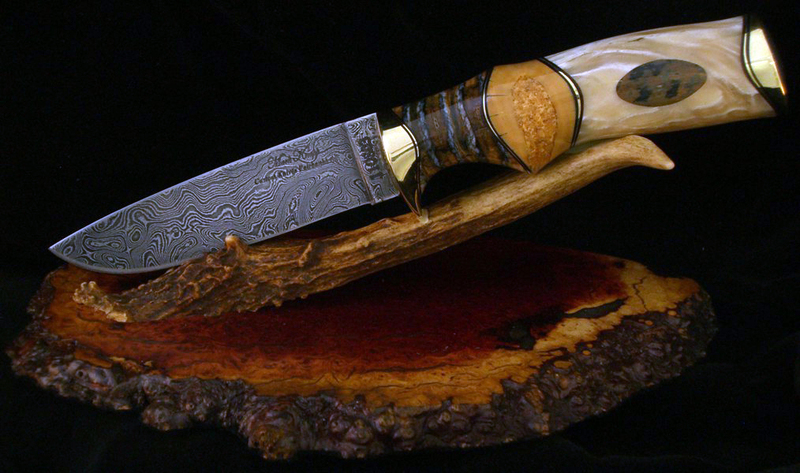 with sunrise pattern handle in musk ox horn, fossil walrus ivory and damascus blades. 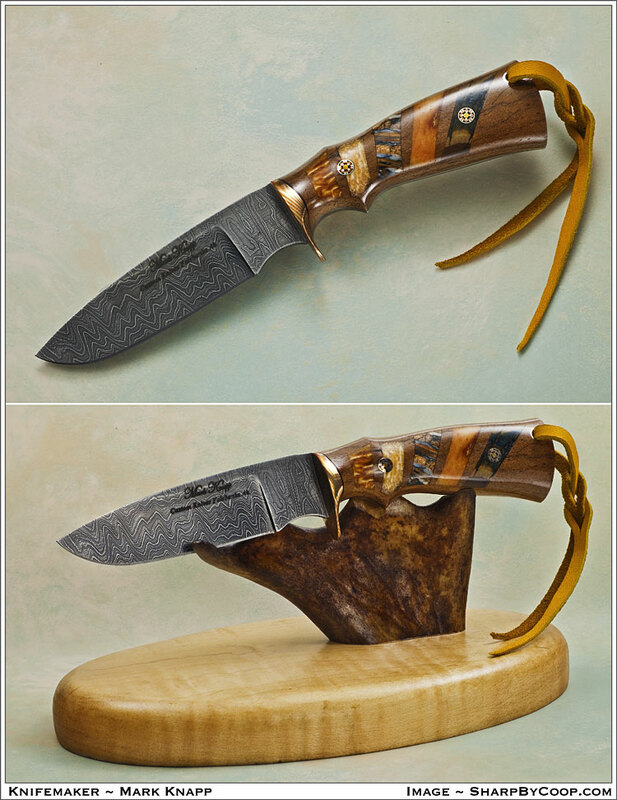 Big game hunter with amber, pine cone and spalted birch. 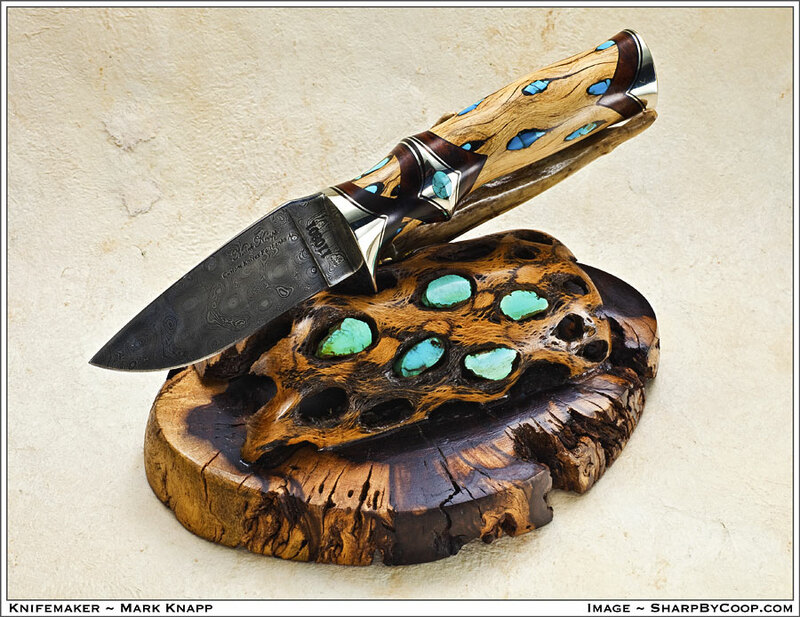 Cholla (choya) and turquoise skinner with desert ironwood and nickel silver guard, spacer and bolster. 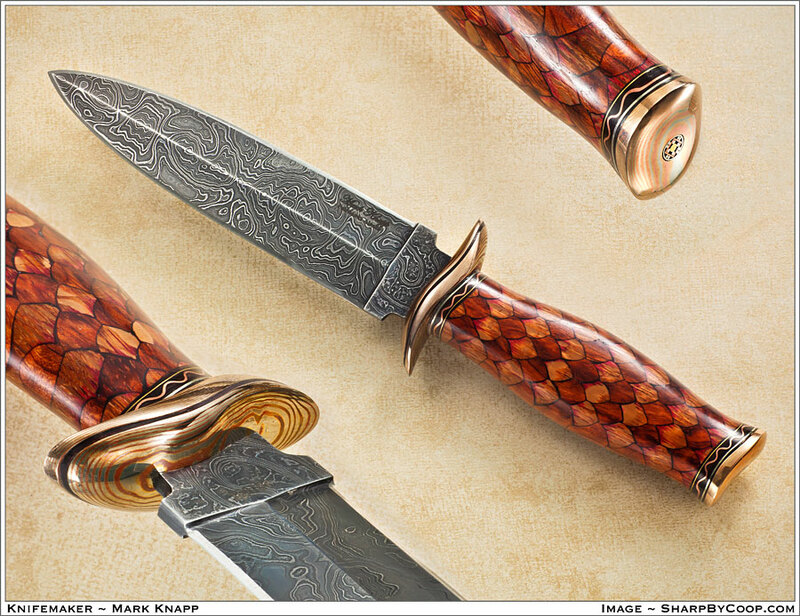 The blade is of 1095 and 15N20 made by Mark. 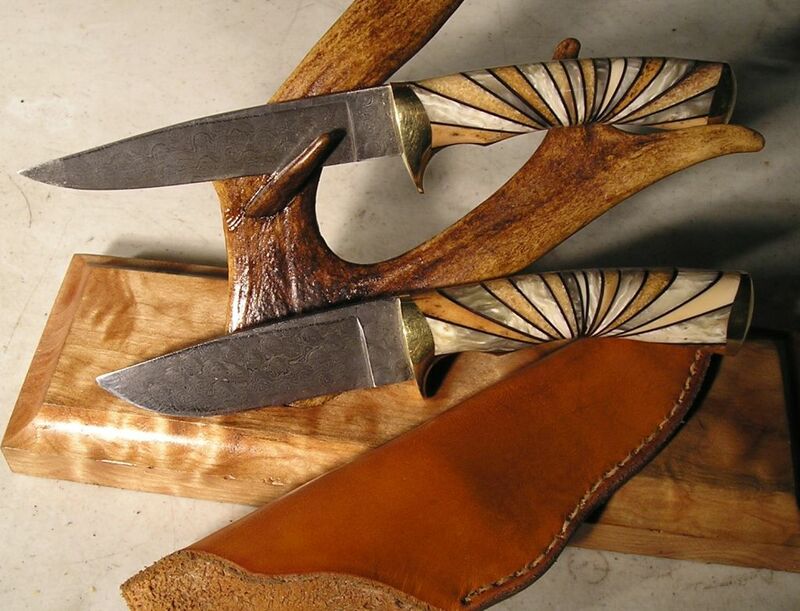 Matching stand and sheath. 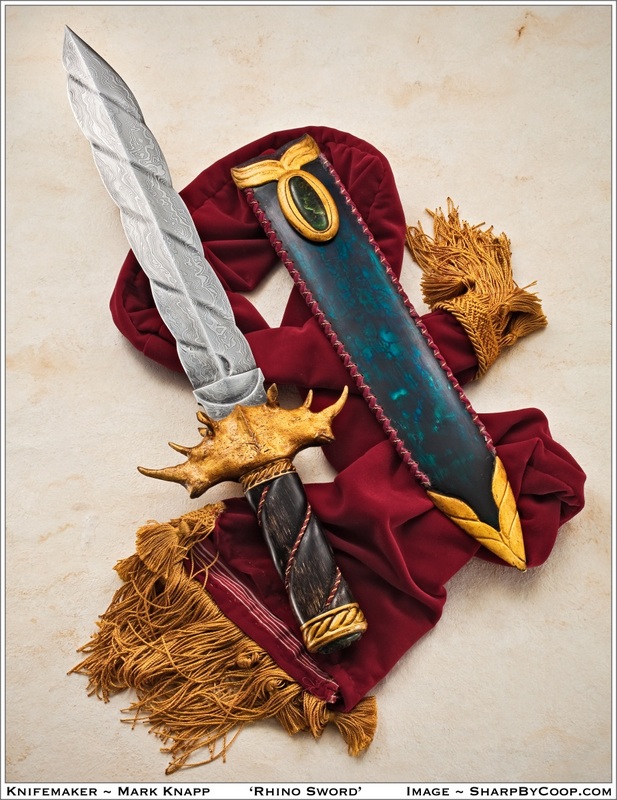 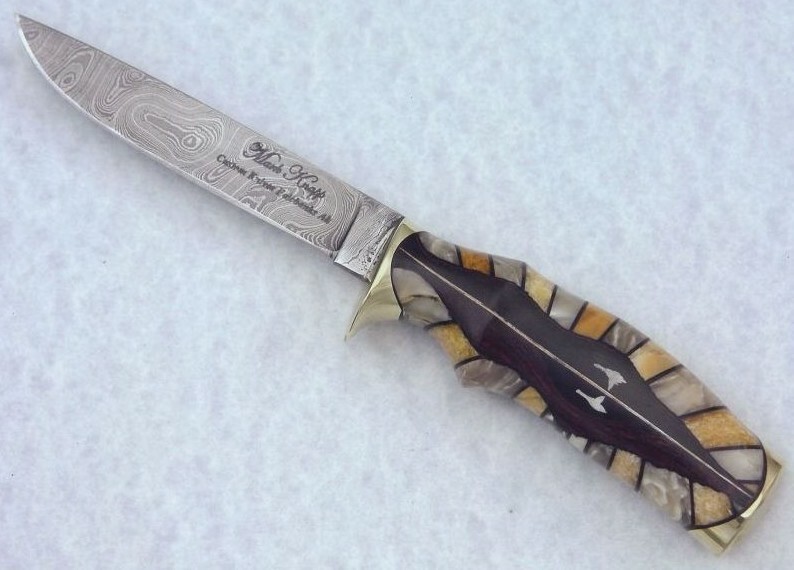 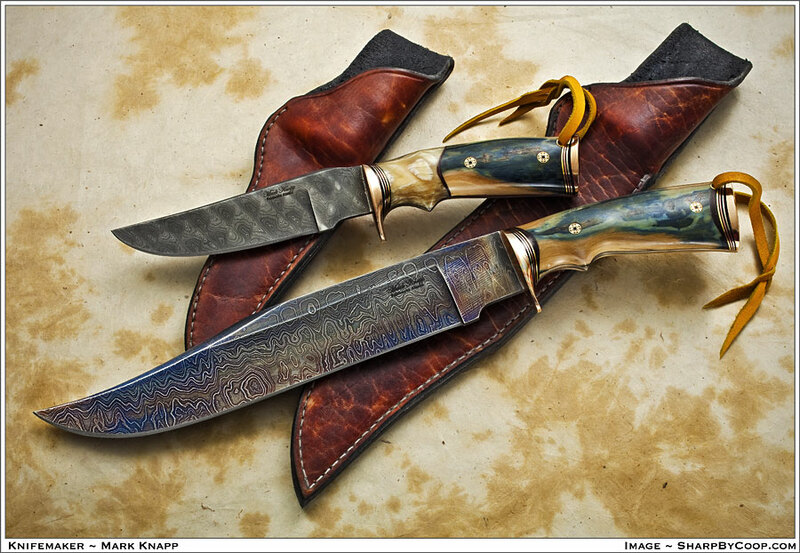 Skinner with a handle of fossil walrus ivory and blue amber; the carbon Damascus blade is from Mark's forge and the guard and bolster are brass. 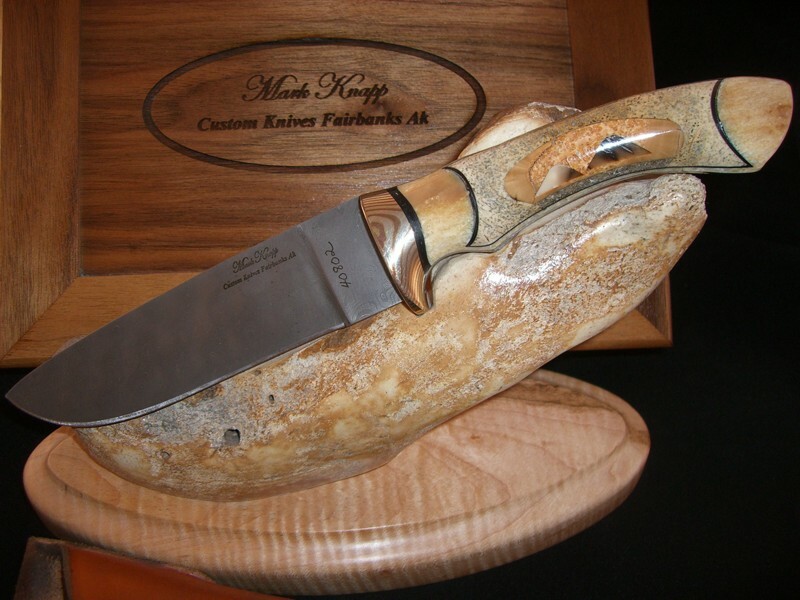 with blue mammoth ivory and musk ox horn. 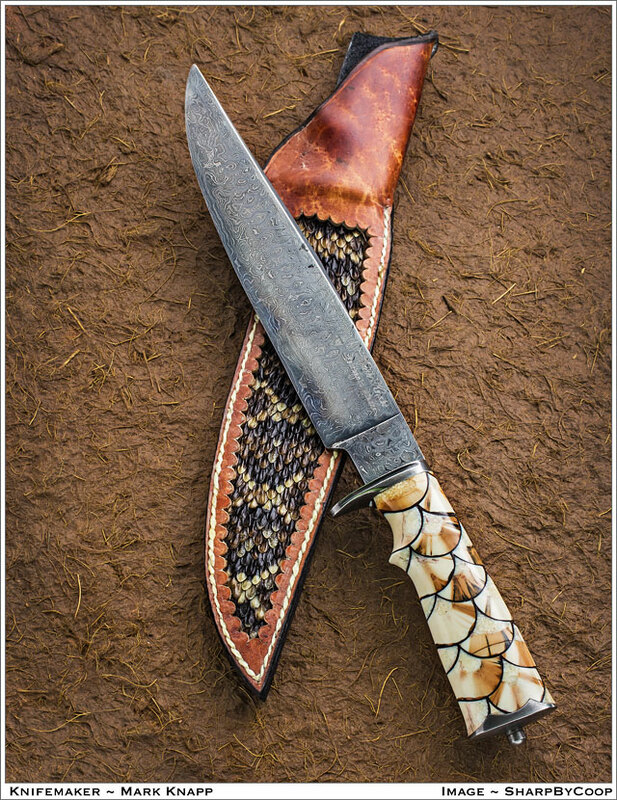 Small game hunter with a hand forged carbon Damascus blade, mokume guard and bolster and a mosaic handle of snakewood cut into a scale pattern, with a scaly barramundi skin sheath. 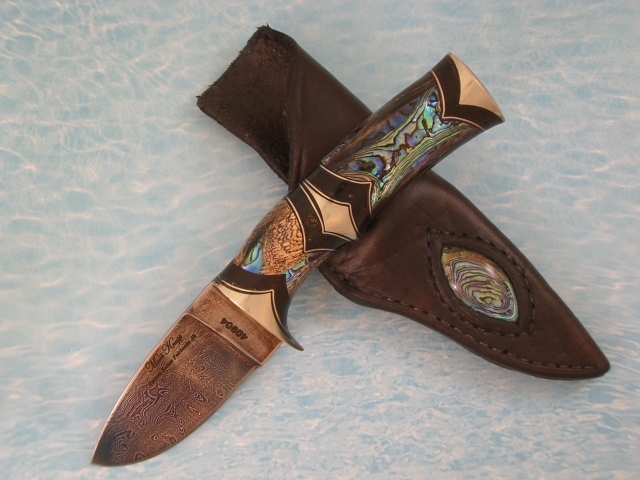 Heat blued blade of carbon Damascus; the handle is of natural abalone shell, blue amber and ebony and the guard, bolster and spacer are nickel silver, with matching sheath. 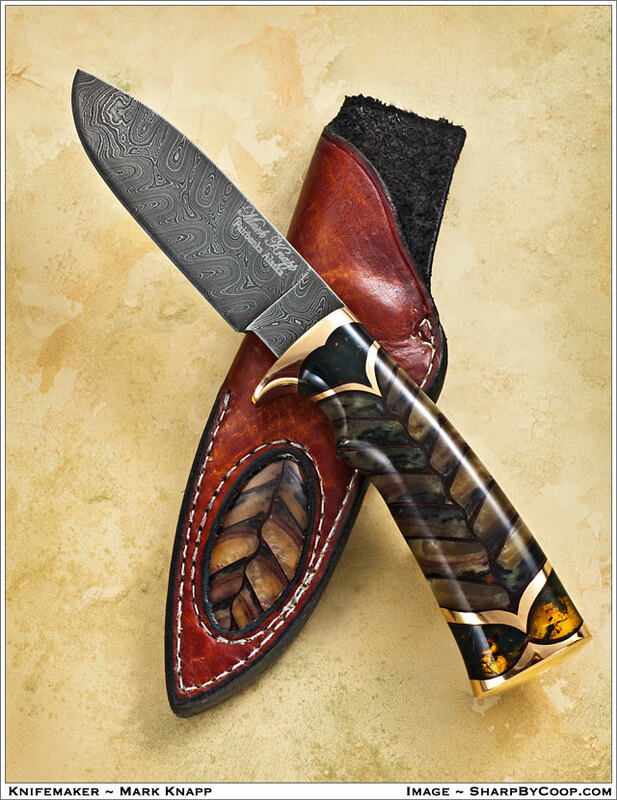 with black sheep horn in herring bone pattern, blue amber spacers, brass guard and pommel and herring bone pattern damascus. 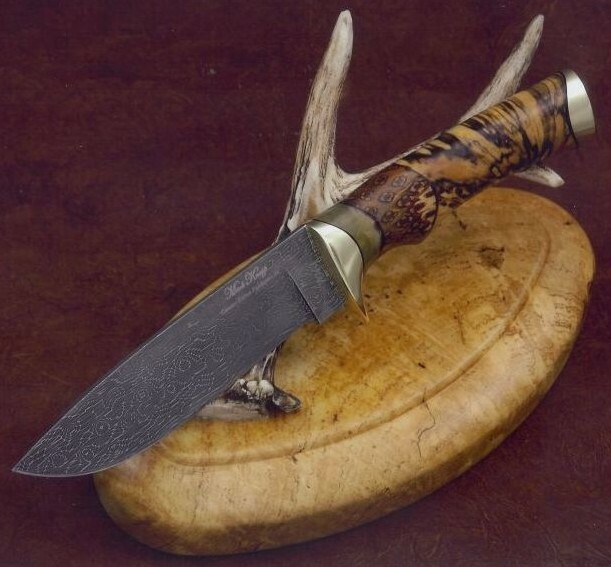 with mammoth tooth, musk ox horn and damascus blade. 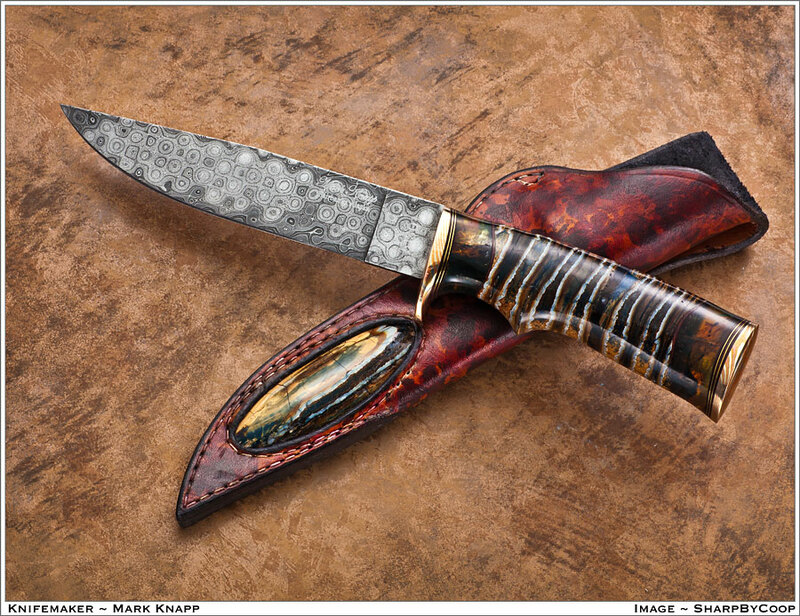 with black mammoth tooth, blue amber, mokume guard and bolster and damascus blade. 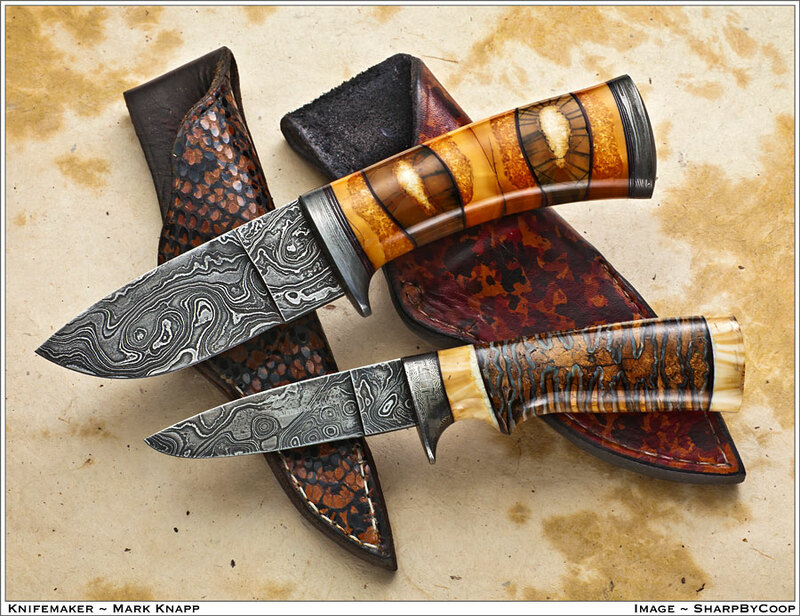 blue amber, mammoth tooth, mokume guard and pommel and stainless steel raindrop damascus pattern blade. 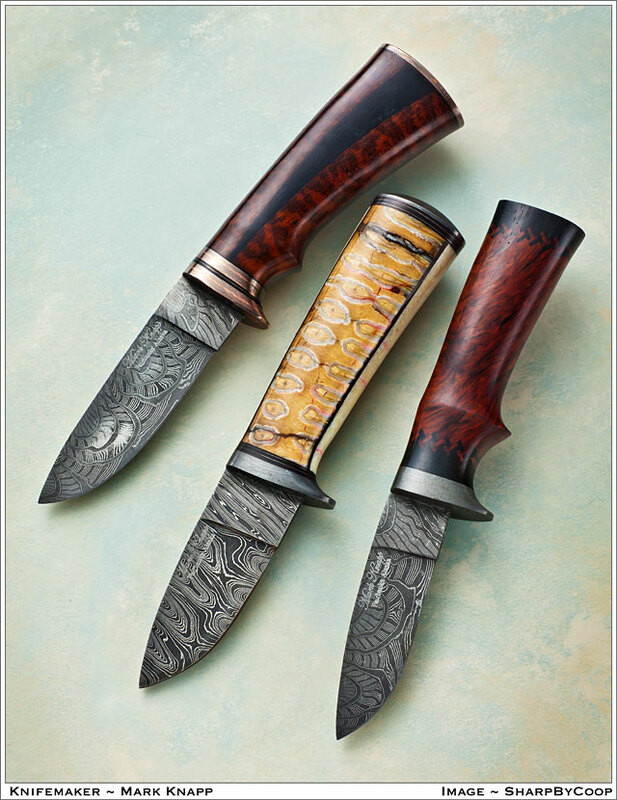 Snakewood and ebony, mammoth tooth and ancient walrus ivory, Jarrah Wood and ebony. 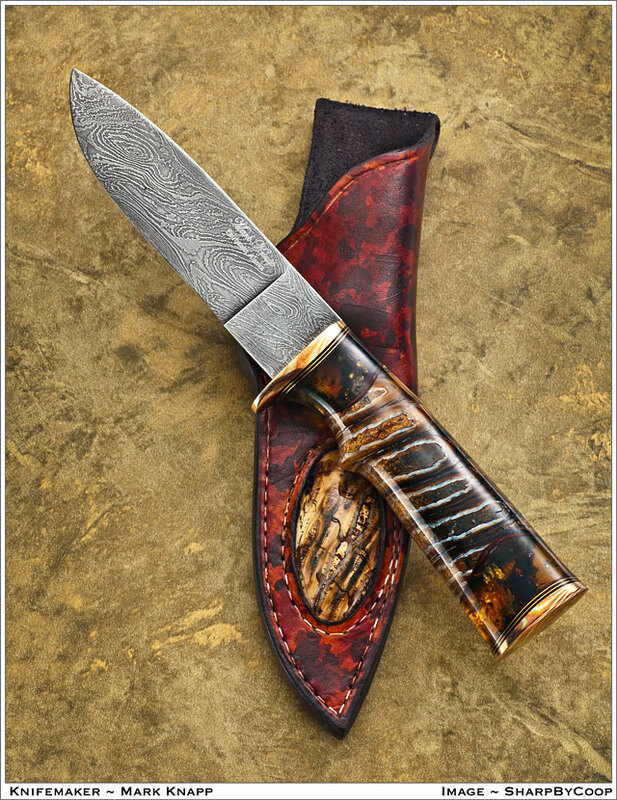 The blade is made of 1095 and 15N20 Damascus. 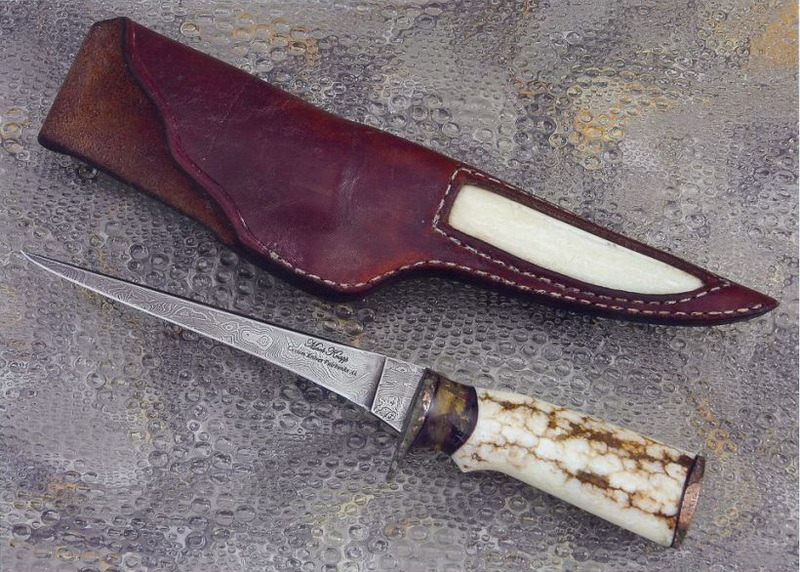 The Handle is made of fossil walrus ivory. 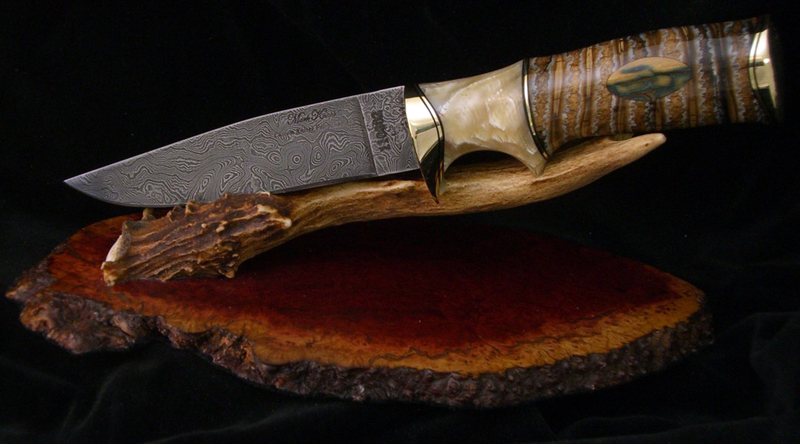 with chain saw chain damascus. 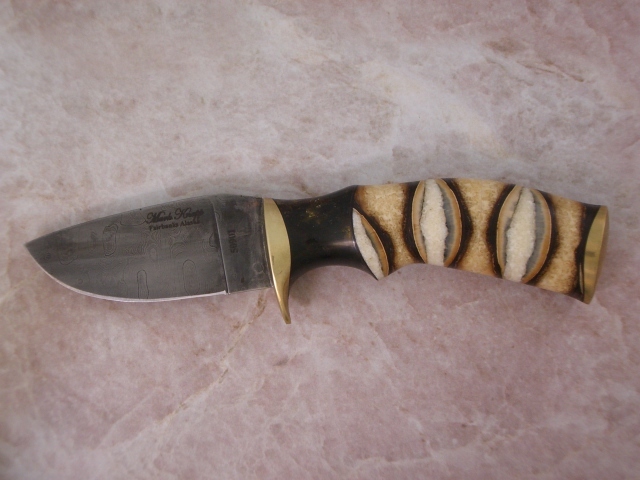 Fillet knife with fossil walrus ivory and blue amber. 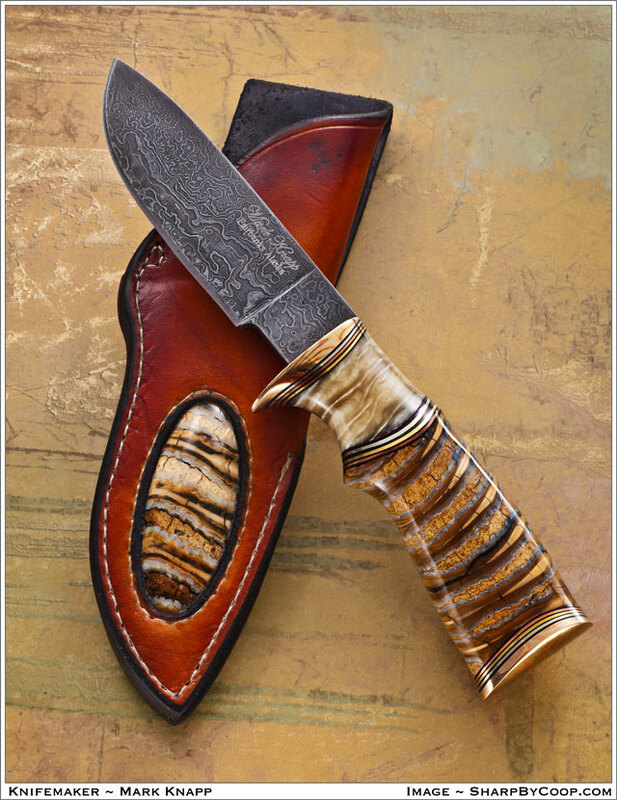 Blade length: 6", Overall length: 9 3/4"
with mammoth bone, mammoth tooth, mammoth ivory fossil walrus ivory and steppe bison horn. 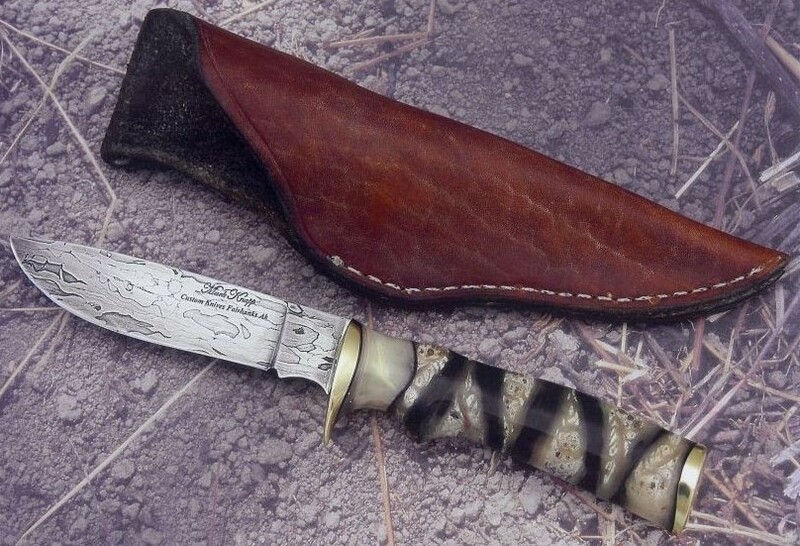 with a woolly rhino horn handle, a mammoth ivory sheath and jade insets. 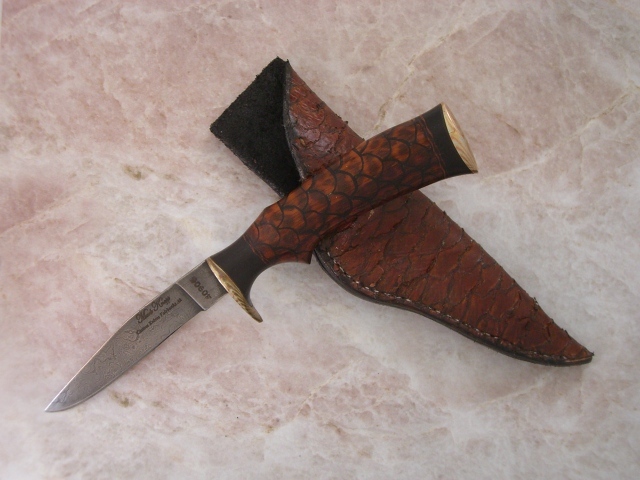 handle of bubinga and lace wood in a scaly pattern.